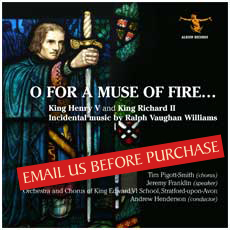 Vaughan Williams’s incidental music to King Henry V and King Richard II. Vaughan Williams responded to the compassion, the insight, the humour and the nobility of Shakespeare. He also recognised that Shakespeare was thoroughly musical, a writer who thought deeply about music. Vaughan Williams took Shakespeare’s many references to English folk-ballads as supporting his own ‘national’ approach to music: ‘Shakespeare makes an international appeal for the very reason that he is so national and English in his outlook’ he wrote in December, 1944. This is a specialist recording and may not suit all. Please email us before purchasing. Recorded at King Edward VI School, Stratford-upon-Avon, from March 18 to 20, 2013 by Nick Fatkin and Michael Webb of Crystal Clear Audio. Post-production and mastering engineer was Michael Webb. The recording has been supported and generously sponsored by Gavin Birkett. Albion Records is very grateful to both Michael and Gavin for their steadfast support to this recording project. The Headmaster of King Edward VI School, Bennet Carr, would also like to warmly thank Andrew Henderson, Musical Director, Richard Pearson, School Archivist and Perry Mills, who directed the play for the centenary productions in March, 2013. Without their unwavering support the productions and this subsequent recording would not have been possible.